It would seem to be a bit of an oxymoron, but there’s a lot of same-yness in fantasy/spec fiction, particularly the work pitched to younger audiences. Stories of magic, and dragons, and evil forces, and objects of power, and lots of characters who seem to have slightly elvish features, or be carrying swords or crossbows or wands… Perhaps it’s the comfortable familiarity of these worlds after repeated re-visiting, or perhaps the Western legends of Excalibur and so on are just the ones that resonate hard with Western audiences because we grew up with them, but many of the landscapes in fantasy are distinctly Tolkien-esque, or of the King Arthur variety. Which is fine – I read and loved Harry Potter like everybody else. But it’s a treat to occasionally come across a story that doesn’t borrow from any of those tropes. It’s like a palate cleanser. A SINGLE STONE (see the US cover on the right) has almost a Margaret Atwood feel – but I think that’s more to do with the fact that any story focusing on matriarchal social mechanics or on the concerns of women is automatically shunted into the Atwood basket. What I would compare it to more properly is Margo Lanagan’s work. It’s stylistically different, but like Lanagan, Meg McKinlay seems to have a gift for inventing utterly original and believable worlds. That uniqueness is what sets it apart. A SINGLE STONE was rewarded for its originality when it won a whole bunch of awards – it won the 2016 Prime Minister’s Literary Award, the 2015 Queensland Literary Award, the 2015 Aurealis Award, was an Honour book for the 2016 CBCA Book of the Year, and many more. It was given a starred review by Kirkus, who called it: ‘A beautiful, sparkling gem’. 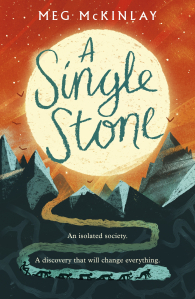 I also think A SINGLE STONE was rewarded for being pitched well – it seems to ride neatly on a very delicate ledge between Middle Grade fiction and YA fiction, which means it can be recommended to readers crossing over from the former into the latter (this feat seems to be more acceptable than riding the ledge between YA fiction and Adult fiction, for instance). I’m just very glad that Meg McKinlay’s lovely brain went spinning, and conjured up something so female-focused, so unusual and special. A SINGLE STONE is a rare gift. Anyway, that’s my opinion – but you might think differently. Please comment here below, or on the Facebook thread to let us know what you thought of A SINGLE STONE. All reviews and comments are welcome, but if you’re strapped for time, you’re also welcome to leave a 1-5 star review. Don’t be shy about telling us what you think! I hope you enjoyed this month’s bookclub title, please stay tuned when I announce a very special new title for next month. I loved this book! I found the parallels around body image were great. A lot to unpack and I agree it’s perfectly pitched tp both MG and YA. Yep – perfect pitch. Glad you enjoyed it Alex!